Jazz crooner Steven Davis ponders “What Happened To Romance,” his first big band album due June 23, led by the original song featured in an international television commercial. 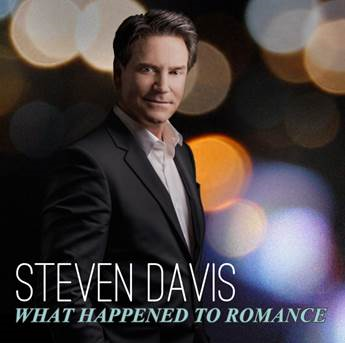 Nashville, Tennessee (23 April 2015): Bolstering the belief that romance is always en vogue, crooner Steven Davis plies his big voice backed by a big band on the swinging set “What Happened To Romance,” a charming meditation on love marrying timeless traits from another era to today’s passionate demand for originality. The 14-track disc comprised of a dozen original songs penned by Davis and The 88s’ Josh Charles and Alissa Moreno – the duo that produced the outing – will be released June 23 by the vocalist’s First Second Records and serviced to jazz radio for airplay. The album’s playful escapade “Perfectly Perfect” is the sublime soundtrack to a television commercial for Centralway Numbrs, a mobile banking application in Germany and is viewable online globally (http://bit.ly/1bhhEZQ). The charismatic Davis was invited to perform at the prestigious I Create Music ASCAP Expo in Los Angeles on May 1 and at the Durango Songwriters Film/TV Expo on May 15 in Ventura, California.